On Wednesday, March 28th, Midtown Oyster Bar will again play host to the annual Bike Newport Night – billed as the best winter party in Newport – thanks to perfect timing at the intersection of winter weary and spring fever! Who’s not ready to put an end to the doldrums and think bikes? With music by Slackwater String Band and Los Duderinos, Midtown’s tasty spread topped with piles of oysters, and a room full of auction items donated by a host of supportive local businesses, it’s a party not to be missed. Each year one program benefits from the event’s fundraising. This year it is the upcoming Big Blue Bike Barn. 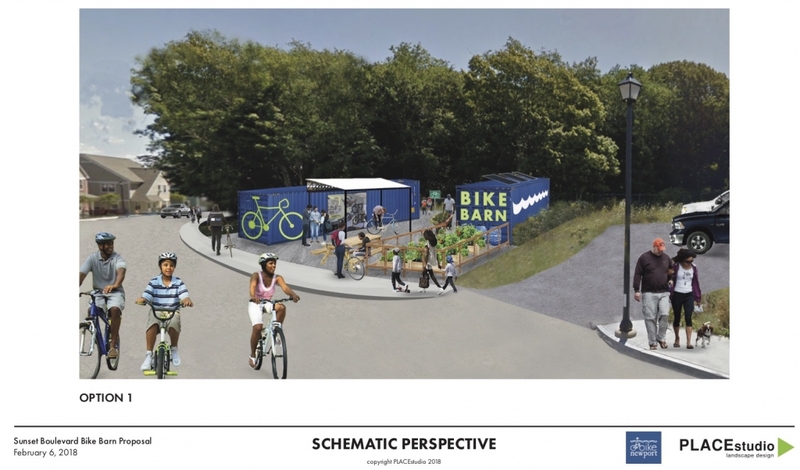 Modeled on the successes of the Red Shed in Olneyville, the new Bike Barn will dramatically increase the size of Bike Newport’s current North Side Bike Library – from one 20’ container to two 40’ containers – quadrupling the size. The program will relocate out of the Florence Gray Center parking lot and onto a lot on Sunset Blvd, immediately adjacent to Miantonomi Park. This past October, 23 city leaders and stakeholders boarded a bus bound for the Red Shed in Riverside Park where they toured and chatted with the staff of the Woonasquatucket River Watershed Council about their site and programs. In February, North Side residents gathered at the Health Equity Zone’s Vision Lab to plan what the Newport version will look like. Place Studio Landscape Design captured the vision in the accompanying illustration. Thanks to multiple partners, the new facility will be a beautiful hub of bicycle, garden, and park activity. Work on preparing the site has already begun; and the new containers are expected to be in place by mid-April. Newport Housing Authority made the land available to house the Bike Barn; the City of Newport is assisting with removing fences, clearing space, and cutting the path into Miantonomi to connect directly with the mountain bike trails in the park. Aquidneck Land Trust is providing access and guiding stewardship of the paths. The Newport County YMCA is actively partnering on creating summer program. Aquidneck Community Table is helping to plan gardens on the site. Solar panels will provide power and rain barrels will collect water. The community will be invited to help with many aspects of preparing the containers and the properties for activity. All funds raised at Bike Newport Night will support the Big Blue Bike Barn. Dedicated funding to date has been generously provided by Powered by Prince at Newport Hospital, the Rhode Island Foundation, and the RITBA Foundation.